Japan's nuclear-power crisis has left the country dependent on aging conventional plants that are being pushed well beyond their normal limits to keep the lights on and businesses functioning. The Fukushima Daiichi accident in March 2011 has increased public opposition to any restarts of the nation's 54 nuclear reactors, which remain idled due to shut down for periodic maintenance checks. Only three units are now operating and even those will be shut down as early as April. 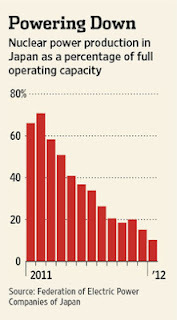 On Monday, Japan said the average nuclear power capacity used for power generation in January was 10.3%. Among thermal power plants, coal-fired plants generally are operated near full capacity, but gas-fired and oil-fired plants, which use more expensive fuels, typically are brought online only when demand rises to peak levels. 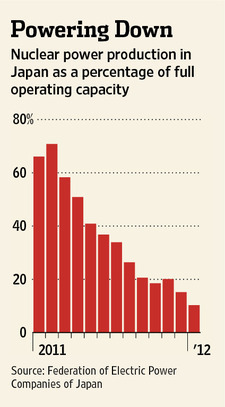 Demonstrating the heavy load, thermal power plants at Japan's 10 regional power utilities were operating an average of 66% of the time last December, up sharply from 45% in the year ended in March 2011.